Are you looking for tools and support to successfully design and implement changes in your organization? Change is often challenging for individuals and workplaces. At times, even implementing changes that are improvements can be met with resistance, in part, because no two people experience change and transition in exactly the same way. This is why change management requires requires both caring and skill, as well as a process or road map to successfully navigate and implement changes in the workplace. Appreciative Coaching is a powerful and effective generative change process for coming together as a team or working group to explore your change goals, deepen your connections and conversations together about the things that really matter, while appreciating the best of what exists already. Appreciative Coaching is theoretically grounded in Appreciative Inquiry (AI) – a revolutionary approach to change management, developed by David Cooperrider in the 1980’s, that is based on the assumption that inquiry into and dialogue about strengths, successes, hopes, and dreams is a transformational process. 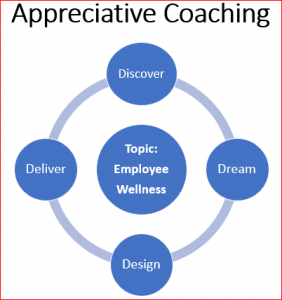 Appreciative Coaching is an approach to leadership and team coaching that is rooted in Appreciative Inquiry whereby you are guided through four stages – Discover, Dream, Design + Destiny – for the purpose of engaging growth and change in a strengths-based, respectful and inspiring way. Bring an Appreciative Coaching Circle to your workplace to support both team building and change management within your group and organization. Call Now to schedule An Appreciative Coaching Circle for your team or workplace.